Their youth and health initiatives now recognized by top official in the country. 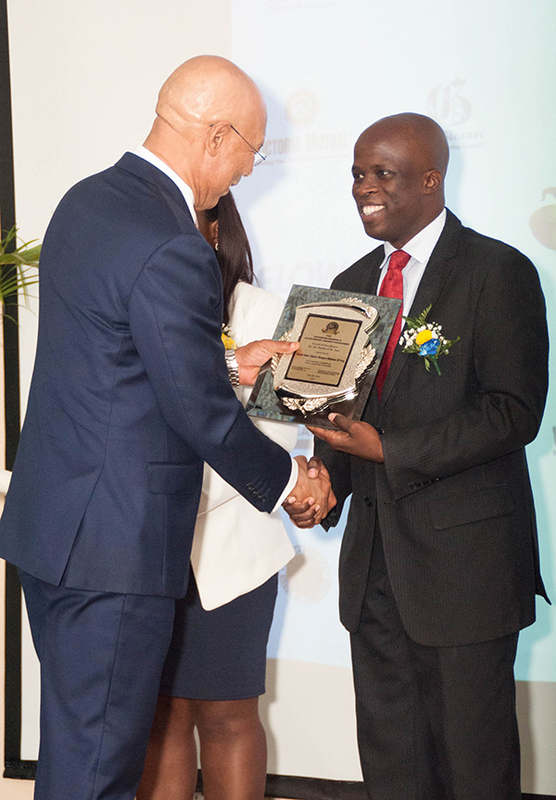 Two Seventh-day Adventist pastors were among 15 Jamaicans from the county of Middlesex, Jamaica, who were recipients of the Governor General’s Achievement Awards. Gordon Lindsay, youth ministries director for the church in northeast Jamaica, in the Parish of St. Mary, and Omar Oliphant, district pastor in the Parish of St. Ann, received their awards during a ceremony held at the Cardiff Hotel and Spa in St. Ann on June 28, 2018. Through his office as youth ministries director, Gordon Lindsay built a strong relationship with numerous communities and groups, affecting many lives outside of the pew. He is a volunteer chaplain of the Jamaica Constabulary Force, which has utilized his community relation skills and projects for youth development. Lindsay has coordinated several community feeding programs and was instrumental in the construction of a house for a homeless man. He currently coordinates the Pringle Children’s Home Development Initiative and Impact Annotto Bay, programs that provide counseling and empowerment sessions for young people, aimed at reducing crime and violence. Oliphant said it was an honor to be given such award, and he dedicated it to all the youth whom he has served. “It is a call towards continued strides of excellence and service which will have an impact on those within my sphere and generation,” he added. 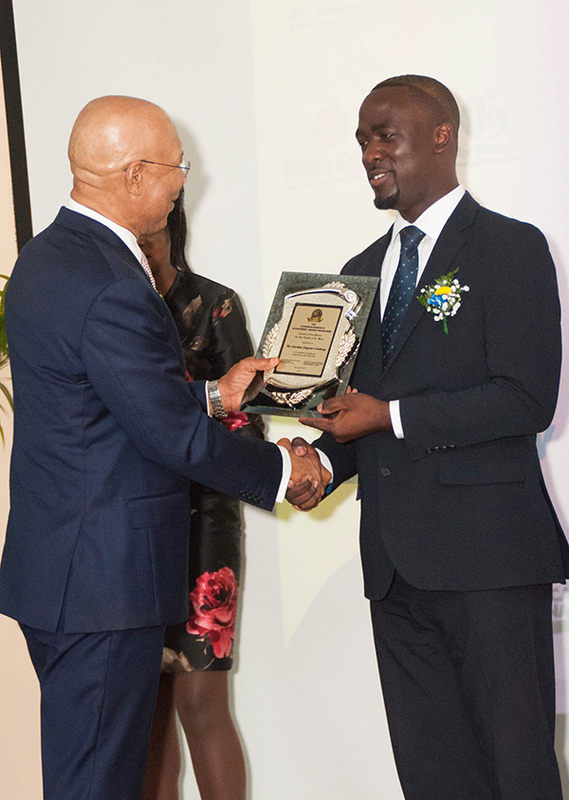 Oliphant made history in the Seventh-day Adventist Church in Jamaica in 2017 by becoming the first ordained minister to become an attorney-at-law, when he was admitted to the Jamaican Bar on December 7, 2017. “From a heart filled with gratitude, I thank every person who has helped to shape and nurture my life and leadership in this direction. May the award inspire more to be the best version of themselves,” Oliphant said. Through a wide and diverse range of activities and engagements, Oliphant, who is the former youth and communication director for the church in north Jamaica, consistently maintained active service to the parish of St. Ann. The parish benefited from his brainchild, the Save-A-Youth Foundation, through the purchase of eight nebulizers for the St. Ann’s Bay Hospital and other donations in cash. The foundation, over its first three years, successfully raised more than JMD$1 million (US$7,700) toward dialysis assistance and other health-care needs. Over the same period, Oliphant engaged hundreds of youth in rallies, youth debate series, drama productions, and musical talent shows. Since the program’s inception in 1991 under the patronage of the late Most Honourable Sir Howard Cooke, the Governor General’s Achievement Awards have been presented to individuals who have not previously won any national award, have excelled academically, and served their community in outstanding ways in spite of humble beginnings.